On Friday, January 18, 2019 the JV and varsity boys basketball teams from Byron-Bergen and Elba faced off in their traditional “Battle of Route 262” games, but this year they had their sights set higher than just a victory on the basketball court. Much higher. In response to two of their classmates receiving cancer diagnoses, the players wanted to raise money for organizations that have helped those individuals and their families. The Ronald McDonald House Charities of Rochester and Cure Childhood Cancer Association received equal shares of the evening’s donations. 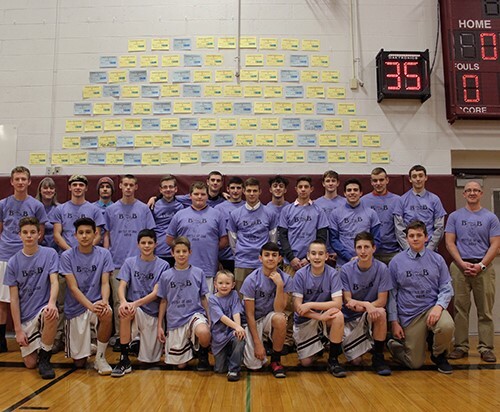 In the weeks leading up to the game, the Byron-Bergen boys’ basketball teams gathered donations from friends, family, and community members and organizations. But, the Bees weren’t the only ones on the fundraising offensive. Elba, a partner District with Byron-Bergen for several sports including soccer and gymnastics, also collected donations for the V Foundation for Cancer Research. The Elba players also joined the Byron-Bergen players in the half-court shot challenge sponsored by Jimmy Z’s of Brockport, NY. Jimmy Z’s donated $20 for every half-court basket. The crowd exploded in applause as two Byron-Bergen players and one Elba player sunk the shot. Both teams played hard with Elba’s JV and varsity teams edging out the bees. However, the biggest score of the evening was the $5,459 raised in support of the two charitable organizations. However, the final count still is not in. Jimmy Z’s pledged to donate 20% of all sales from customers who mention Byron-Bergen’s fundraiser on Monday, January 21, but due to inclement weather the final fundraising effort is rescheduled to Monday, January 28 from 11 a.m. to 9 p.m.